By Chris Williams on September 2, 2014. Sometimes, stray cats, or raccoons, opossums, even rats will den around a home, especially in an accessible crawlspace. These animals have fleas too, and these fleas can find their way up into living spaces, especially if the animal dies or is removed. Squirrels nesting in an attic can be contributing fleas. Sometimes identifying the type of flea can provide a clue as to the animal source, but the common cat flea feeds on both pets and wild animals (see Cat Fleas vs. Dog Fleas?). If you’ve had any visitors with pets, those pets could have left fleas or, more likely, flea eggs behind. Female fleas stay on the pet but their eggs fall off and later hatch into flea larvae. Even if the pets were confined to the porch or back deck, resulting fleas could hitchhike into your home. If your yard has been visited by feral cats, stray dogs, opossums, or other wild animals, you can be assured that these animals have fleas and that those fleas are leaving eggs behind as the animals pass through your yard (see Can Wild Cats Be the Source of a Pet’s Fleas?). Most of this activity would happen at night so you probably wouldn’t even know that you’d had visitors. If you recently moved into your house, there could be fleas present from the previous occupants’ pets. 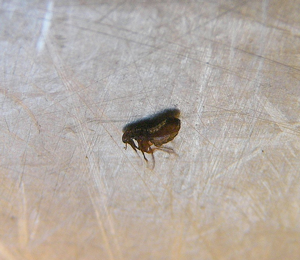 Adult fleas can survive for many months in a vacant house without feeding. Even larval fleas that are fully developed can patiently wait inside their pupal cocoons for up to a year until a warm-blooded animal or person appears on the scene. Likewise, if you used to have a pet, eggs left by that pet’s fleas could hatch and eventually develop into adult fleas, many months later. If there is no longer a pet to feed on, those fleas will feed on people. The only good thing about your situation is that you don’t have a pet (or pets) to treat for fleas. You will still have to have your home treated by a professional exterminator to eliminate future generations of fleas. Even more importantly, you need a professional inspection to try to determine the source of your flea infestation. Give Colonial a call today.